I love having wonderful AtoI friends where we swap ideas to aid the development of our children. The other day Rubi was telling me about her daughter spending time outdoors exploring moss and then says, “I need outdoor activities.” What?! You’ve just been telling me about this fabulous sensorial, nature experience your daughter has been having and you need more ideas? So I took a moment to reflect on her question as I hadn’t really given this topic too much thought for my own daughter other than going outside daily. She’s not capable enough to get to many places independently or do the myriad of outdoor practical life activities that an older child might be doing. 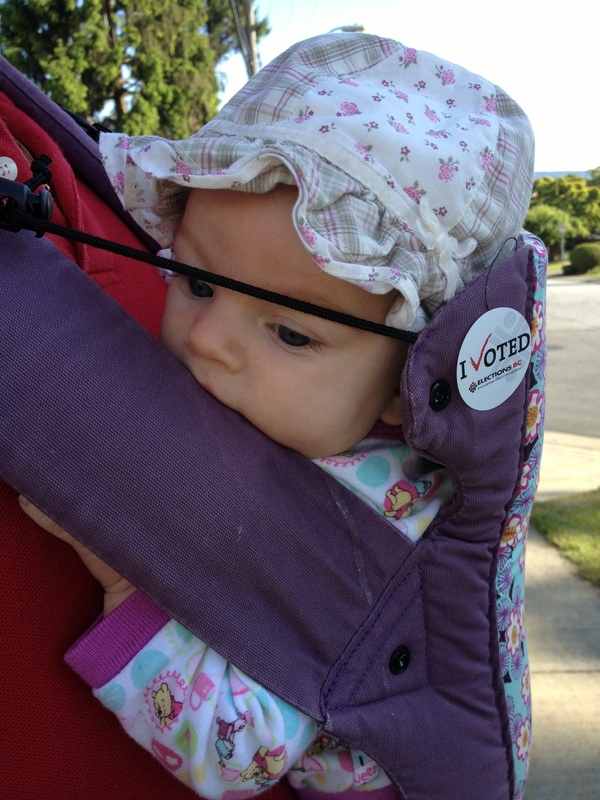 Rubi’s question made me wonder how we could provide more opportunities for our babies to experience nature outdoors. Here’s what Rubi and I came up with. 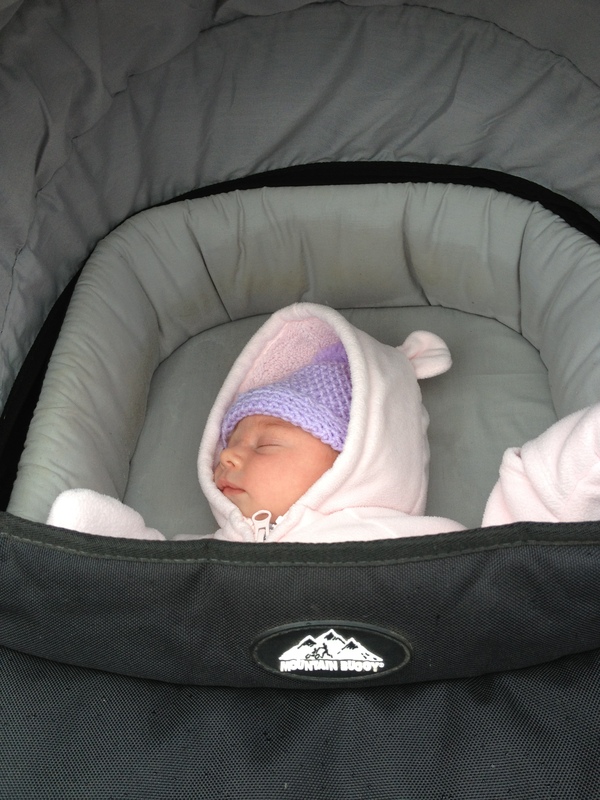 When A. was younger she went for walks in her bassinet style stroller so she could fully stretch out her body. A car seat places a child in a propped up position and straps the child in. 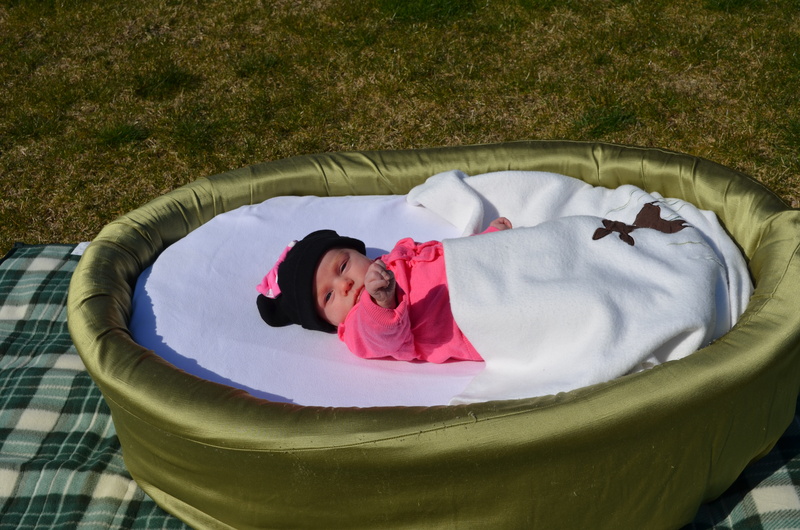 In her bassinet stroller , she could stretch her arms above her head and kick her legs around. She could turn her head to look where she wanted, including looking at me as her point of reference, but mostly she slept. She also greatly loved being cuddled up close to our bodies, so for many months she went for a walk being carried in the Beco. Now that she is older she enjoys being awake for most walks and sits up in her stroller to take in all the sights. We mostly go for walks in our neighbourhood so she can enjoy many flowers but we also go to the woodland park near our house. I think this bit of daily fresh air is good for all of us as a family. While we don’t always go outside everyday, we definitely do so multiple times a week. When A. was younger I would place her outdoors in the cestina or on her topponcino in the Moses basket. By the time she was two months, I mostly placed her on a blanket and she would listen to the birds or listen to me read her stories. 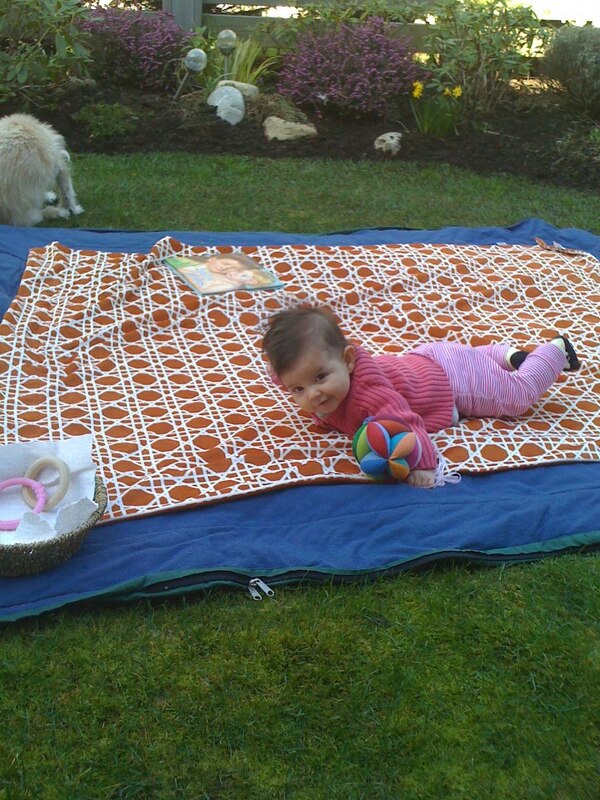 She would also enjoy tummy time outside. We mostly did this in our backyard. Rubi did the same with F., often bringing a basket with a few toys outdoors. Rubi has also provided F. with a wind chime to listen to. Rubi reminded me that blowing some bubbles for a baby to observe is also a lot of fun. Having a sprinkler for the baby to experience water would be fun too. During the summer I would often go for picnics and I would try to place A. in the shade of a tree so that she could watch the movement of the branches and leaves in the wind. She was also able to observe the clouds, flowers, and whatever is around. I was thinking that going somewhere with a river or stream would be a lovely experience. 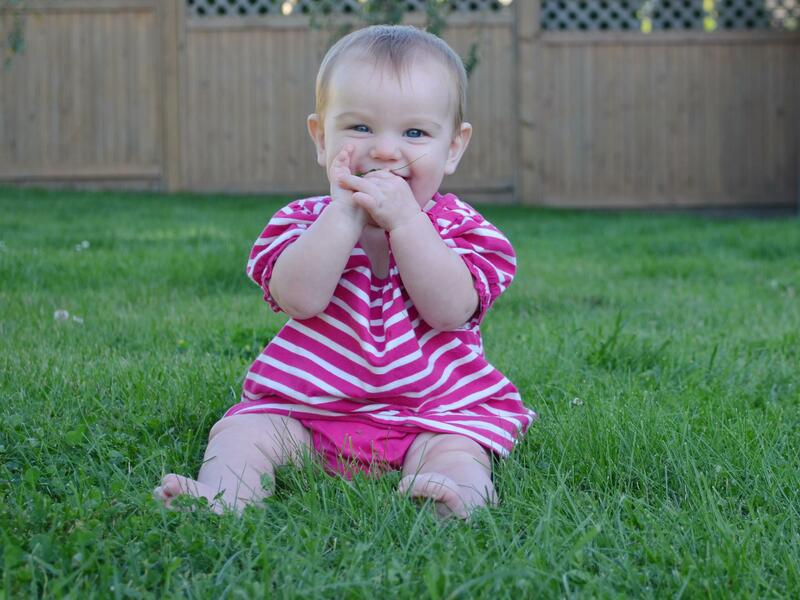 Enjoying food outside (nursing or solid foods) is also a different experience for a baby. 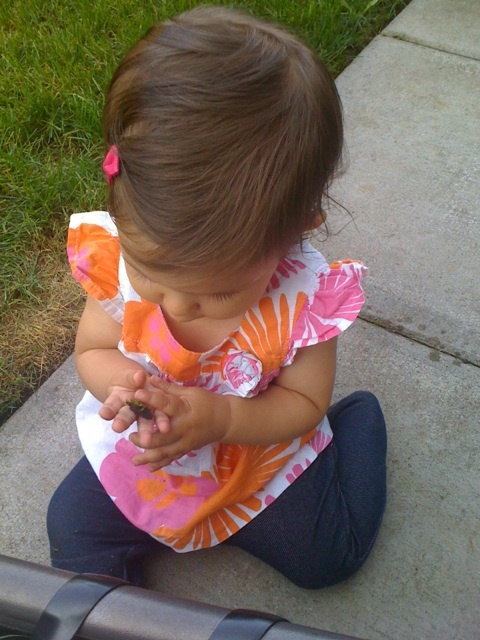 Rubi provides items from nature for her daughter to play with when outdoors. Her daughter explores with various items such as grass, sticks, and moss. F. is developing her pincer grip by picking up small pieces of moss. I am enthralled with the sensorial experiences F. is receiving as she touches the various textures and, of course as babies do, puts the items in her mouth. Rubi has also provided a bucket of rocks for F. to place rocks in and out of. Many mornings A. and I will go for a quick “garden tour” before her morning nap to check out the plants that are growing. It has been great fun with a vegetable garden as I talk to her about the various plants we have growing and allow her to feel them. 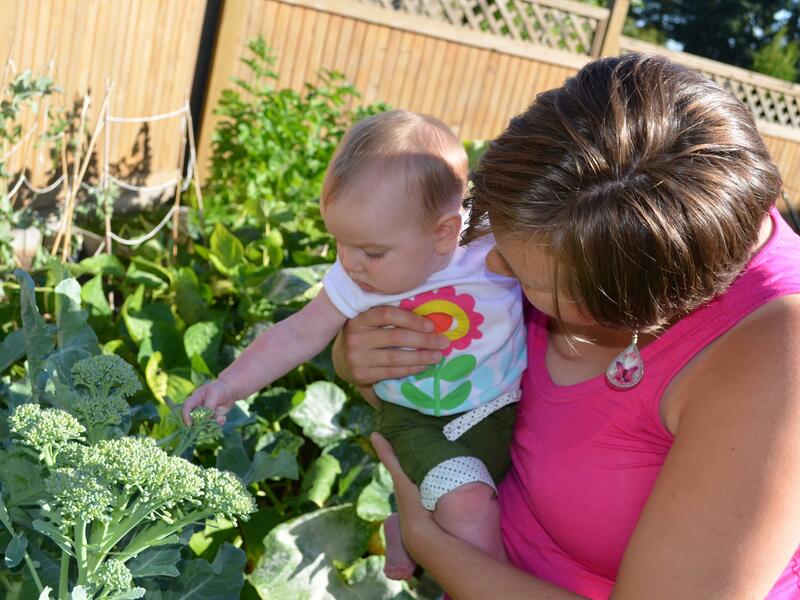 She has had the opportunity to feel smooth pea pods, prickly squash leaves, and bumpy broccoli. 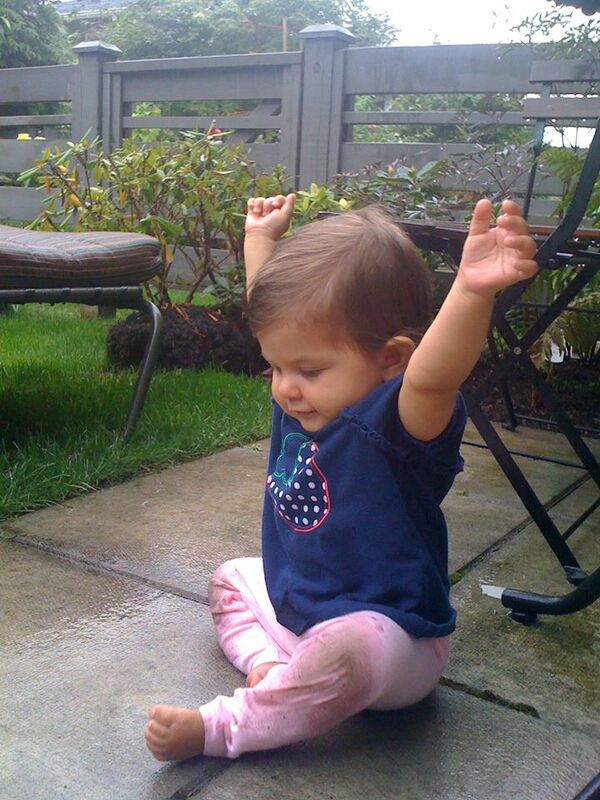 Since my conversation with Rubi, I have been encouraged to let A. have time on the grass. Often this occurs prior to dinner. She has greatly been enjoying the opportunity to sit on the grass, pick grass, and experience it by eating it. Outside of the daily experience in the backyard, I think it is great to expose your baby to sandy beaches, swimming in a warm lake, and whatever other natural places happen to be in the area that you live. 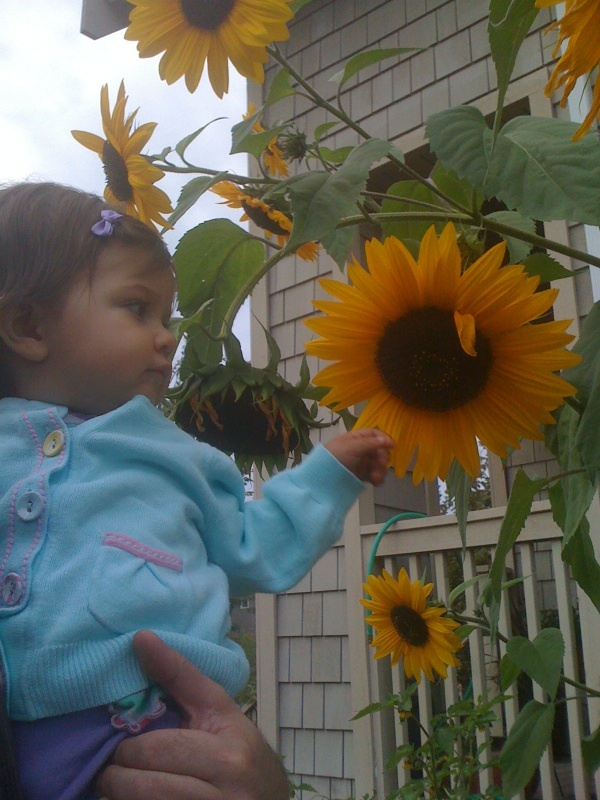 As long as your baby is able to see, hear, smell, taste, and touch items of nature! For an older baby, it is fun to go to the playground. If you can find a playground built for toddlers this is even better. Once your baby is able to sit independently, then he/she is ready to enjoy going on the swings. Carefully observe your baby for signs of enjoyment and distress as sometimes this experience is not enjoyed by babies, or the enjoyment can quickly change into distress. F. has a lot of fun on the swings and at the playground. 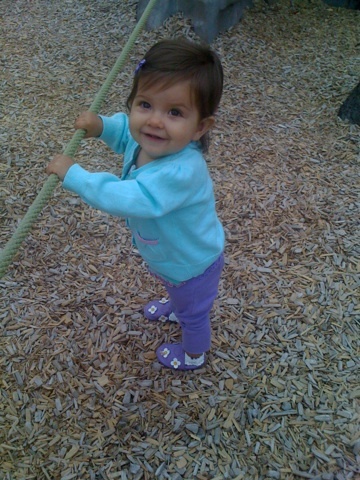 She crawls around on the equipment and on the wood chips, greatly enjoying exploring the wood chips. She is now pulling up, cruising along, and trying to climb up on much of the equipment. 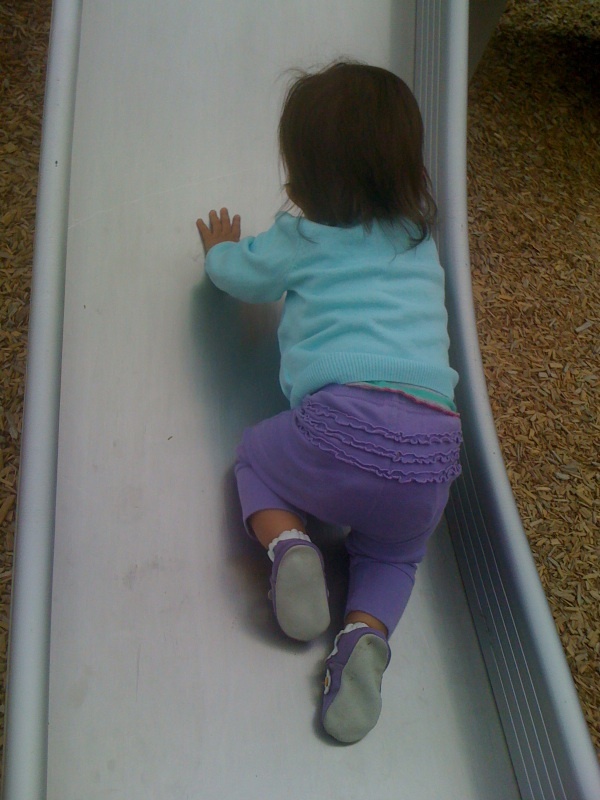 She also enjoys going down the slide. 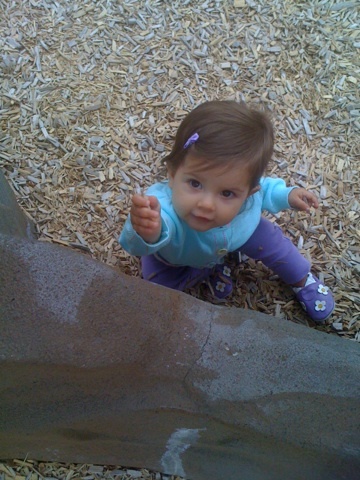 While it may seem obvious to go to the playground, often F. is the only baby at the playground! Rubi commented that it is because other parents don’t want to bring their child who is not yet walking because the child will get all dirty. Appropriate clothing meant for play is important for children of all ages, including babies. Most of us tend to be fair weather lovers. Instead, most of us live in places where it gets cold, hot, rainy, snowy, sunny, and windy. I believe that there is no bad weather, only bad clothing choices. Both A. and F. were born in the winter. We bundled up our babies and took them outside. During the summer A. was too young to wear sunscreen so we sought out shade and covered her up when spending extended periods of time in the sun. One particular rainy day, F. went outside and played in the rain and puddles. What a delightful experience! 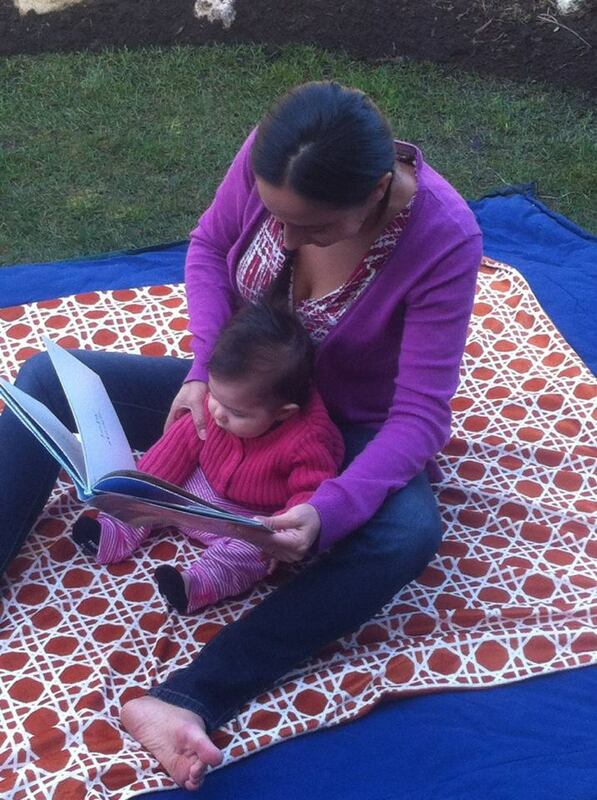 We hope you have fun outdoors with your baby, cultivating a love of nature right from birth! Do you have more ideas to share with us? What about winter and low temperatures? During the winter the baby can experience the chill of the winter air, the snowflakes, feeling the snow, the beauty of the frost on the ground and branches, and the sound of winter birds. Thanks for mentioning the playground. 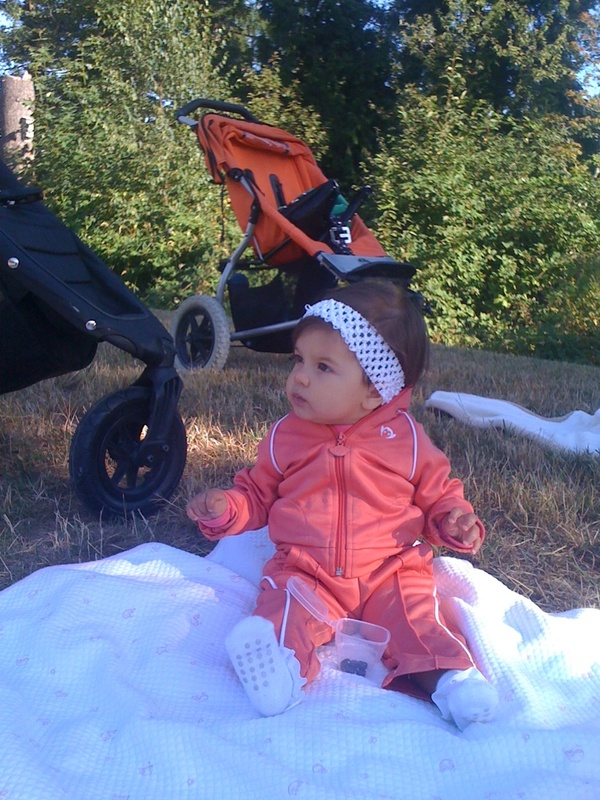 We have a lovely playground in our neighborhood and now that she is 7months I will start taking her there. This post was invaluable! Yayyy! We’re off to the park!